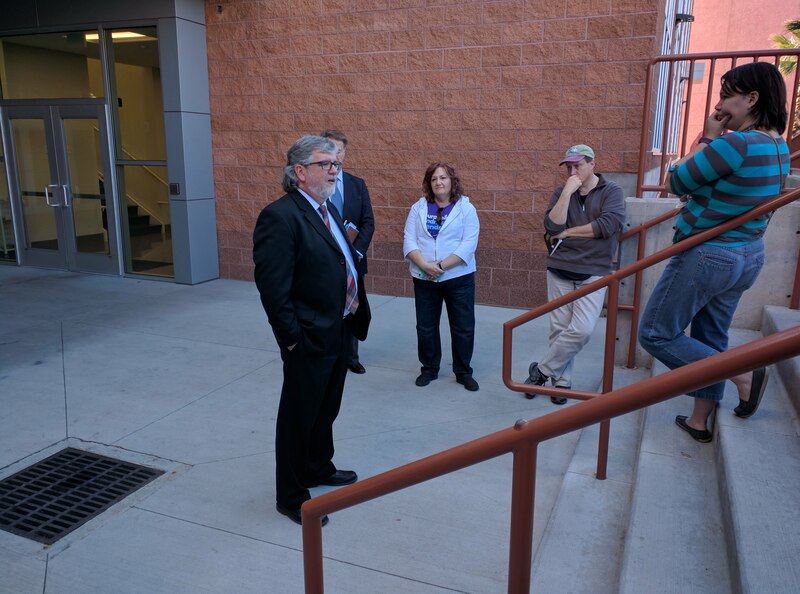 ST. GEORGE — Two long-time Dixie State University music professors were fired Friday to the dismay of many students. Glenn Webb and Ken Peterson, both tenured professors of 10-plus years, were terminated on the grounds of violating university policy, according to a statement issued by DSU. The exact policy violations were not specified by the university, which said they fell under “DSU Policy 371.” The policy includes a wide scope of reasons for corrective action, such as incompetence, insubordination, disorderly conduct, discourteous or abusive treatment of others and unsuitability to job requirements. 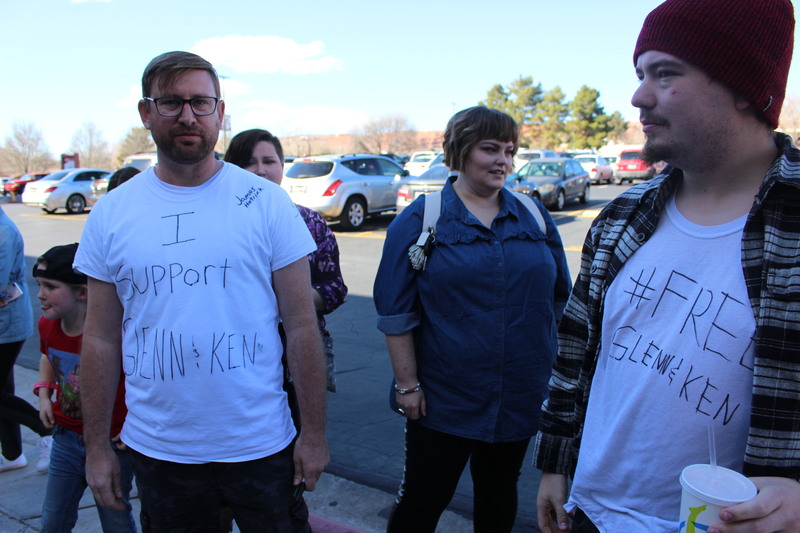 “Dixie State has made a decision regarding some of my actions, which I do not dispute,” Webb said before an audience of students and faculty gathered in support of the professors. “They are my actions, I did what I did. “My attorney, Mr. James Elegante, and I don’t believe it is an egregious or even serious violation of policy,” Webb said, noting that he could not go into detail about the case while an appeal is pending. Peterson said the reason for his termination was based on hearsay witness statements saying he said derogatory things about certain university employees. Both professors said they will appeal their termination. They are currently suspended with pay while the appeals process goes to a faculty review hearing, at which point the president of the university, Richard B. Williams, will make a final decision. However, Peterson said he was not especially hopeful about the appeal process, referencing the 2015 firing of 15-year tenured professor Varlo Davenport, who was terminated despite a faculty review board and the faculty senate clearing him of wrongdoing. Davenport was acquitted of a single charge of assault in July 2016 after a student accused him of pulling her hair in an acting class. “As in the case with Varlo, he (Williams) ignored the faculty review board conclusion and fired him, anyway,” Peterson said, “That’s what I anticipate. In its statement, DSU said any misconduct claims are met with a thorough investigation conducted with multiple checks and balances in place. “The university president is not involved in the initial investigation or decision-making process, so he/she can stay impartial for the appeal process,” the statement reads. Following the terminations, dozens of students and faculty surrounded the entrance to the university’s M. Anthony Burns Offices in support of the professors. 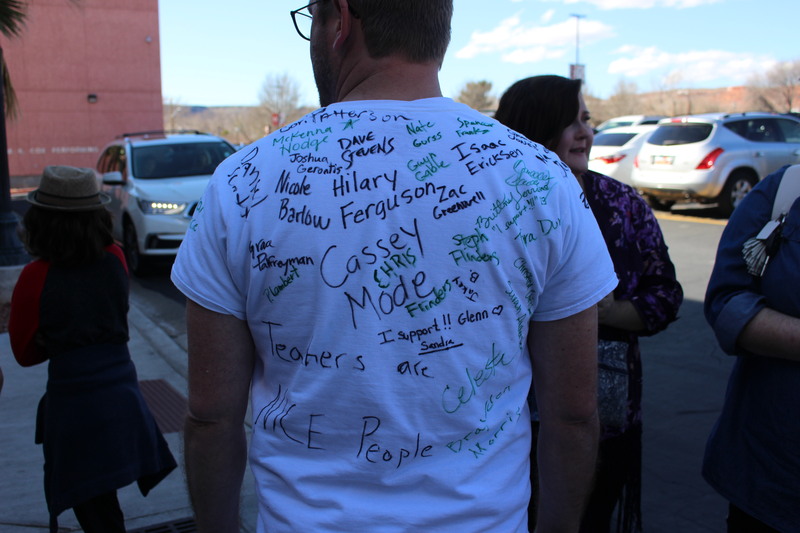 Leavitt and many other students in attendance at the gathering said the professors’ dismissal will be a major detriment to their education. “Both of them have shown without exception how much they care for their students, and I have seen them work so hard to support us,” Suzanna Collet, a senior music student, said. Webb had been on administrative leave for more than six weeks before he was terminated Friday. DSU senior Gwyn Gable said his absence has been acutely felt since that time with adjunct faculty stepping in to teach in his place. “I have a senior recital in three weeks and I haven’t been able to get the mentoring from Glenn that I’m supposed to,” Gable said, adding that she’s found it difficult in Webb’s absence to accomplish what’s necessary to graduate. Webb’s absence, and now Peterson’s, has put an extra load on existing faculty, DSU professor of music Bryant Smith said. Webb had also been instrumental in developing a bachelor of music program at the university. With his dismissal, music student Danelle Sullivan said her plans to stay at the university for an additional year to complete the new program are in jeopardy. “This is simply not a stable enough educational environment to stay unless something happens that is drastic and that changes the environment,” Sullivan said. She said an atmosphere of fear has been created due to a lack of transparency on the part of the administration when it comes to disciplinary measures like the one enacted Friday. She and many other students with whom St. George News spoke said they do not believe Webb and Peterson deserved to be fired. “I’m 100 percent confident that there’s no legitimate reason for this,” Sullivan said. Webb told the gathered students to keep working toward their education at DSU. DSU’s statement said the university understands the difficulty students face when professors are terminated. 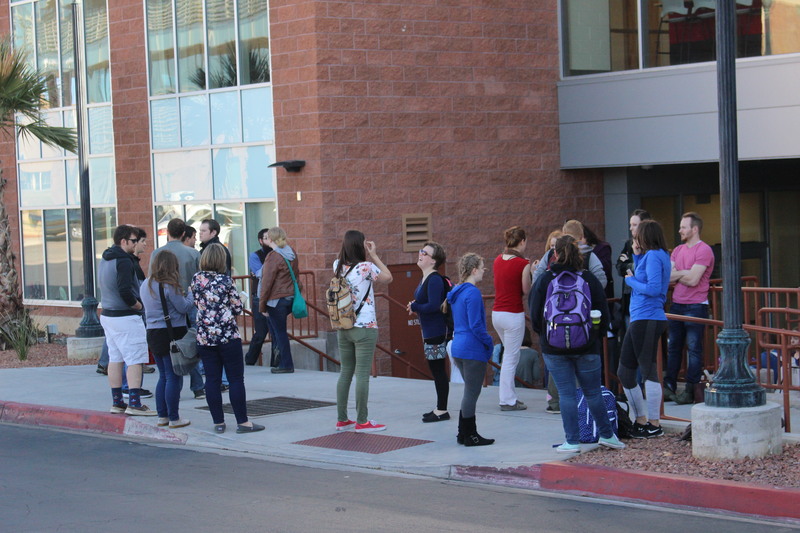 “Dixie State will continue to support students, faculty and staff and abide by DSU, state and federal policies and procedures,” the statement reads. Just another story of the St. George “good ol boys” abusing their power to run out all those that oppose them. “How are we going to pay for the new football stadium? Let’s fire all the music professors and close the music department down.” I can guarantee my kids won’t go to that corrupt school. Actually it is the good ol boys getting fired. 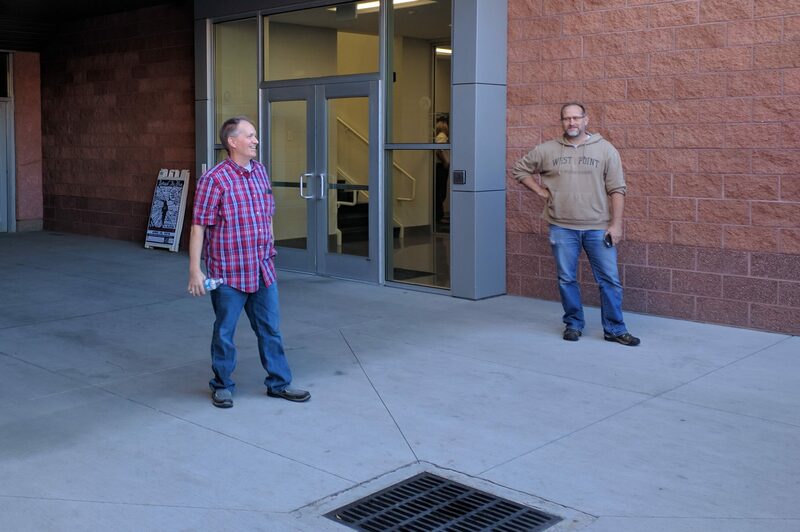 The Administration at Dixie State consists of entirely non-local personnel. They are almost all from out of state and have little to no connection to Southern Utah prior to coming to DSU. Hard to pass judgement here as the charges aren’t public at the moment but one thing is sure, the tenure system in higher education needs to be revised. Being tenured forever seems to lead to a decline the quality of teaching. There is no motivation for professors to keep improving their skills. Some of the worst professors I ever had were ones on tenure the longest. Like any job, employment contracts and tenure should be subject to renewal every few years to ensure the best quality of education. You don’t have to know what you are writing about, do you, No Filt? Without the previous campus security sleuth working for the president, these two may have a clean shot at reversal. Much to your chagrin. You don’t even make sense. Stop trying to be all cryptic. It isn’t cute or witty. With a daughter interviewing for tenure-track teaching/research positions here in the United States, I have to wonder what these guys did that warrants termination. It will take four to five years of hard work, including demonstrating a variety of abilities to qualify for tenure. Once earned and granted, there are comprehensive expectations for future contributions and performance. If something happens that violates the school’s code of conduct, even tenured staff are susceptible to termination. It is not a “Get Out of Jail Free” card. Folks tend to have the mistaken impression that “tenure” is like being a federal government employee, requiring an extremely serious offense to be fired. I would say that I would never work in the DSU Fine Arts Department. It seems they want to get rid of everybody. Good luck to these professors and lets hope that due process is followed. Maybe some secret liaisons with current or former students? That’s the first thing comes to mind. Not enough info to go picking sides. I’m still not sure davenport didn’t deserve termination as well. Fact is, I’m not well informed enough of the situation to decide either way. I’m not a fan of DSU. Maybe their end goal is to eliminate performance arts and music programs altogether. We see many collages eliminating those and liberal arts programs in general in favor of “STEM” programs. Who knows. Everyone got them skeletons in the closet. I’m getting so I don’t like to speculate on a lot of things based on news presentations because the info is so very limited. Whether or not Varlo (is that the actual mr. davenport?) was guilty of something serious enough to warrant termination I have no idea. A lot of news article presented the case for termination as totally unfounded. It’s what I potentially don’t know… like I said, can’t know for certain. Not my place to take sides either way. So how ’bout it? any skeletons in old the closet? Or is life just unfair? *So how ’bout it? any skeletons in the old closet? Or is life just unfair? Yes, this is Mr. Davenport – I’m not hiding behind anonymity. You say you’re not “well enough informed” but that hasn’t stopped you from implying some very ugly behavior on my part. Why? I wonder if you’re not implying something by insisting I’m implying something. Fact is I’ve heard about that sort of thing occurring not so rarely. If you were fired just bc the good ol’ boy power structure at DSU simply didn’t like you and wanted you gone, well, thats really crappy. Maybe you’ll get your day in court if that’s the case. But who are we to believe? I hope you’re not gonna go nuts and go for some kind of revenge plot against DSU’s administrators. Best to move on with your life, trust me. Take care. And anyway, I always tend to take a more negative view of human nature, because experience has shown that that is far more realistic, and I’m usually right. I’m always always always more surprised by good behavior than by bad. If your attempted criminal prosecution as well as your termination was a total load of BS, well, maybe you can get some $$$ out of this city and DSU. But like I say, if you can’t then you need to move on. It isn’t worth festering your life away over it. Best to start over in a new city and leave it all behind. Don’t be so modest, Bob. You are far less than not well informed. You now qualify for “dunderhead of the week” fame. How ’bout it Nolan. Would you stick up for old Varlo? Or these old music teachers? You all were colleagues, yes? Give us ur take on it, nolan. I was in the class for which Varlo Davenport was fired. I promise you he is 100% innocent. Could it be because replacements will pull a smaller salary? And how about misconduct claims against the administration, and the president? Who investigates those. Probably no one. Dixie does whatever it wants. Tenure means nothing. It’s embarrassing -and sends a message to educators who are willing to make substantially less to move here. I’d say tenuring is a load of BS. Teachers are like politicians and dirty diapers. They need to be swapped out for fresh ones when they hang around too long and become fetid and useless. Whiners will whine. Out with the old, in with the new. It’ll be a good thing in the end. Where is mesaman? He should’ve been fired long before he hung around long enough to become a full time socialist parasite on the state’s welfare pension system. comments, what do you do for a living? Have you ever worked as an educator? Have you ever worked in education? This story is not about tenure, it’s about revenge against those who supported Varlo Davenport who was proven innocent in a court of law and still lost his job at Dixie. This story is just starting, the corruption goes all the way to the president of the school. Anyone who is a threat may lose their jobs. This is a developing story I can promise you that. I’ve noticed these old tenured professors can become egotists. You people feel free to wallow in these conspiracy theories. So DSU might be a crappy place to work. So administration can fire anyone they choose at will. Go work for another college if it’s that bad. Good Lord. I agree with you somewhat on the tenure issue. However, if the college is going to start laying off tenured professors, then they should lay off ALL the tenured professors. I guess the real issue for me is that there have been 5 (yes, two that haven’t been reported as publicly) faculty that have been laid off or forced into retirement who were good teacher who actually cared about the courses that they teach and did the best for their students. All the while, there are lazy, horrid professors that are tenured that are allowed to stay. I believe it is very much about revenge against those defending Varlo. If dsu wants to operate as a corrupt ‘old boy’ network what can be done about it? And to be fair, many many colleges in this country have huge problems with corruption. I have no interest in it. If you people want to take it on as a project, good luck.